Leading Northern Irish chilled and frozen food producer TS Foods located in Castlewellan are delighted to be nominated in two categories at this years Business Eye First Trust Awards (BEFTA’s). The BEFTA’s 2018 – which take on the highly successful 12 year mantle of the former UTV Business Eye Awards – recognise excellence, growth and innovation across Northern Ireland’s diverse business landscape. Castlewellan-based TS Foods has been in operation since 1978 and produce a wide range family favourites including Tony’s Chippy, TS Foods Stuffings and Ann’s Kitchen as well as a large number of foodservice and bespoke products. 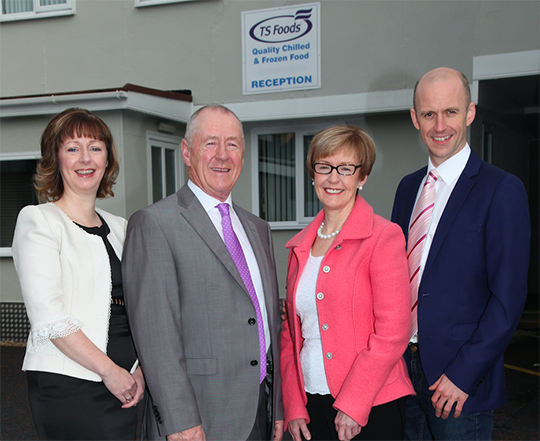 Tony Steele and Ann Steele, the founders of TS Foods with their daughter Joanne Molloy and son David Steele. TS Foods was formed in 1978 by husband and wife team Tony and Ann Steele to produce a range of convenience foods including the well-known ‘Tony’s Chippy Pastie’. The company now has a Grade A quality accreditation from the British Retail Consortium. The awards ceremony will take place on Thursday 22nd of November at Belfast’s iconic Waterfront Hall.